Hispanic Heritage Month happens between mid-September and mid-October and is marked by celebration of Hispanic culture and history at the Posada Del Sol affordable senior community. This year, Posada resident, Robert Para organized a kickoff celebration that included dancing, historical recitations, and two buffet tables full of food made by our own Posada residents. The event brought enjoyable fellowship among friends, neighbors, and families. 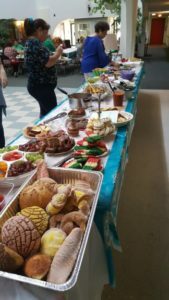 The capstone to the month long of celebrations included more food offerings but also live entertainment from wonderful local mariachi singer/dancer, Alba! The residents and their families enjoyed singing along and especially loved Alba’s children getting in on the action with their own songs! Recently, the Posada residents organized a watermelon festival with all food and deserts made from watermelons. The gathering provided the opportunity for quality family and grand parenting time! Mary Daugherty was the recent recipient of a Fox 4 Pay it Forward award and was featured on a broadcast. See the broadcast here. Mary founded “Candy Coated Christmas” 12 years ago to serve needy children at Christmas. Mary works tirelessly to make the event happen every year despite her own challenges. This year was particularly challenging because three of her major benefactors passed away leaving critical expenses uncovered. Mary and her helpers pulled together and got donations from organizations such as the Kansas City Chiefs, the Royals, and Sporting KC. These items were combined with many donations from those in the community and auctioned off. We are happy to report that the auction surpassed its goal and raised thousands more than expected and the Candy Coated Christmas will continue to serve children that might have otherwise gone without anything under the tree this year or food to eat.